One of my favorite things to do in October is sample the season’s freshest crop of pumpkin ales. Robert and I tried to attend Elysian Brewery’s “Great Pumpkin Beer Festival” earlier this month, but it was insanely crowded. I guess I’m not the only one who looks forward to pumpkin ale season. Since we couldn’t get in at Elysian, I decided to do my own pumpkin ale tasting at home. Here is a roundup of some of my favorites. Dogfish Head’s “Punkin’ Ale” – Punkin’ is a brown ale brewed with fresh pumpkin, brown sugar, allspice, cinnamon and nutmeg. The aroma is subtle, hinting ever so slightly at pumpkin pie. The flavor, on the other hand, is sweet and spicy and unmistakably pumpkin. These flavors are so well-integrated with the beer, it feel like a very natural match, almost as if all brown ales could be improved with a little pumpkin and spice. This ale is full-bodied but still highly drinkable. I had it as an after-dinner treat, but I think it would also pair well with food. Elysian Brewery’s “The Great Pumpkin” – Elysian doesn’t bottle The Great Pumpkin too often so I stopped by the brewery to sample it. This is one of the most lauded pumpkin ales out there and with good reason. The Great Pumpkin is made with roasted pumpkin seeds, cinnamon, nutmeg, cloves, allspice and a whole lotta pumpkin. It is an Imperial ale which means that it is stronger and higher in alcohol than your average beer. The color is a beautiful copper-brown. You can certainly taste the pumpkin and spices, but the beer is incredibly well-balanced. It is sweet, but this is offset nicely by a hoppy bitterness. This is a very easy to drink beer. Very easy. Elysian Brewery’s “Dark O’ The Moon Pumpkin Stout” – With its dramatic werewolf label and spooky black-as-night color, Elysian’s Dark O’ The Moon is a perfect choice for the Halloween season. This beer is so dense and thick that I couldn’t see any light shining through it. The mouth feel is amazingly smooth. Delicious notes of chocolate, roasted coffee and caramel abound, and there is just the right amount of bitterness on the finish. Unfortunately, I really didn’t detect any pumpkin. If you’re looking for a pumpkin beer, you will likely be disappointed. On the other hand, if you are a fan of stout, you don’t want to miss this one! The Bruery’s “Autumn Maple” – This is not actually a pumpkin beer. It is made in the same manner as pumpkin beer but uses yams instead! Autumn Maple is brewed with 17 pounds of yams per barrel along with spices, vanilla, molasses and maple syrup. It is a Belgian Strong Dark Ale and has a whopping 10.5% alcohol by volume. This beer has a lot going on. It is sweet and tart and spicy all at once. Yams, malts and sweet spices are all present. Unexpected flavors, such as prunes, come through as well. And then there’s the classic yeastiness that you get with the Belgian beers. This beer is kind of crazy and quite different from the other ales I tried. It might not be for everyone, but I enjoyed it! Robert was recently given a gift certificate for two to attend the Bon Vivant School of Cooking. Bon Vivant is a local cooking school which offers series courses such as “Mastering the Basics” as well as individual cooking classes. Individual classes focus on specific regional cuisines, cooking methods or types of dishes (desserts, salads, etc.) There are also occasional field trips to foodie locales around Seattle such as Pike Place Market. 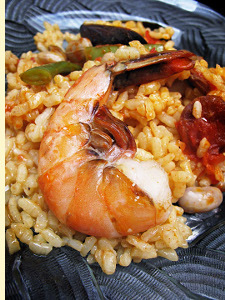 After browsing through the class listing, I finally settled on the “Saveur Cooks: Spanish Classics” class. Spanish food isn’t my favorite cuisine, but the menu for this class sounded irresistible: Tortilla Española (Spanish Potato Omelette); Espinacas con Garbanzos (Spinach with Chickpeas); Alcachofas en su Salsa (Artichokes in Their Own Sauce); Paella de Mariscos (Shellfish Paella); Patatas a la Riojana (Potatoes Stewed with Paprika and Chorizo); Gelat de Crema Catalana (Burnt Cream Ice Cream); Carquinyolis (Catalan Biscotti). Despite being a pretty popular school, Bon Vivant is definitely a small operation. If you are picturing a big classroom with individual cooking stations for each cook, think again. Most of the classes are run by Louise Hasson out of her home in North Seattle, and the cooking is all done in her single – albeit large – kitchen. It is much more of an intimate experience than you get in other cooking schools. Twelve students in one kitchen gets cozy real fast! We arrived to find two rows of folding chairs set out facing Louise’s kitchen; on each chair was a printed booklet featuring the recipes we would be preparing that day (all of the recipes for this class come from Saveur Magazine.) Once everyone was seated, Louise briefly went through the recipes with us, noting any quirks or special techniques to watch out for. A sign-up sheet was passed around, and each student signed up for the dish that they were interested in making. Then, we started cooking! We were sent home with Saveur-inspired goodie bags, and Robert was the lucky winner of a $25 gift certificate to igourmet.com! If you like cooking or are just looking for something fun and a little different to do, check out the Bon Vivant School of Cooking. Louise really knows her stuff. I’ve been cooking for a long time, but I still picked up a few tips here and there. Now that Robert and I are experts, it has already been decided that the theme for my family’s Christmas Eve feast this year will be Spanish Classics! My newest goal is to learn more about the different styles of beer. I prefer wine, but wine just doesn’t feel right when you are at the pub. I’ve been in a bit of a beer rut for several years now. I typically choose one of two styles of beer when I’m out: a nice, hoppy IPA or a cheap yet light and refreshing Mexican, Japanese, Polish, etc. lager. This spring, I branched out and tried a Belgian pale ale, and I enjoyed it very much. Its spicy, almost floral, aroma was unique and made me realize that, like wine, there is a whole world of beers out there each with their own unique style. It was time I got to know some of them. One website that I find particularly useful is beeradvocate.com. There, you will find information on the various styles of beer, up-to-date beer news, community forums and tons of beer reviews. Recently, I enjoyed a beer called Mothership Wit from New Belgium Brewery. A quick search on beeradvocate.com informed me that this a witbier, a Belgian style of beer that is traditionally brewed with spices such as orange peel and coriander. Witbiers are typically very aromatic and a bit sour. Because they are unfiltered, witbiers are usually pale and cloudy in appearance (hence the name witbier which means “white beer.”) You may be familiar with Hoegaarden, a popular witbier found on many pub menus. I liked this style of beer enough that I picked up a bottle of Deschutes Brewery’s 20th Anniversary Wit to try. It was quite similar to the New Belgium Wit but perhaps a bit more subtle with the spices. After work yesterday, I stopped by Pike Street Beer and Wine Shop, a relatively new neighborhood beer store located on Capitol Hill (on the corner of Pike and Belmont.) They have beers from all over the world – Russia, Japan, Great Britain, Lithuania, you name it! They have a decent selection of domestic beers as well. I spotted some rather unusual beers including a Japanese red rice ale and a beer brewed with dates. When I mentioned I was interested in learning more about beer, the shop’s owner suggested that I come to one of their weekly beer tastings (every Friday from 5-7.) Sounds like fun! I picked up a couple of saison farmhouse ales (sturdy, rustic beers that were traditionally brewed for consumption by farm workers throughout the summer harvest) and a bottle of Dogfish Head Brewery’s Punkin’ Ale. Dogfish Head is one of the highest rated pumpkin ales on beeradvocate.com. I cracked that one open last night. It was less pumpkiny than the Elysian Night Owl I tried last year. Mostly, it tasted like a well-crafted brown ale: a bit bitter and bit sweet with just a light hint of pumpkin pie. 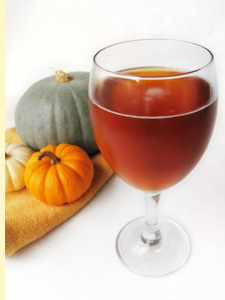 Pumpkin ale – what a perfect way to kick off October! Check out the orange eggplants I picked up at the farmer’s market last Sunday! Aren’t they cool? I’ve seen purple, green and white eggplants before but never orange! They look like tomatoes or miniature pumpkins but, I assure you, they really are eggplants. Unfortunately, I don’t know what variety they are. To me, they look a lot like Turkish Orange Eggplants, but I was told that they are actually a Thai variety. These eggplants are from one of my favorite stands at the farmer’s market, Alvarez Farms. They had eight or nine varieties of eggplants for sale (as well as enough peppers to rival what I saw in Santa Fe)! In addition to the wacky orange eggplants, I picked up some Thai green eggplants and a larger purple and white striped eggplant. The man I spoke with at Alvarez Farms informed me that, compared to purple eggplants, the orange eggplants have a bit more “bite” to them. Eggplant can sometimes be bitter so I was hoping that “bite” wasn’t some sort of polite term for bitter. He suggested that I use them in curry so that’s exactly what I did. I made a simple Thai red curry with orange and green eggplants, tofu and basil. Even though I overcooked the eggplants slightly, they remaining relatively firm and didn’t get slimy at all (woo-hoo!) The flavor was nice and, well, eggplant-y. It may have been a tad on the bitter side, but I actually didn’t mind; it was well-matched to the spicy curry. Unlike the green and purple varieties, these eggplants didn’t lose their fiery orange color once cooked. It made my curry so pretty. If you see any orange eggplants at your market, be sure to pick them up! Flat Blake came up to Seattle to visit my mom for a couple of weeks. Flat Blake lives in San Antonio, Texas with Big Blake. While he was here, he learned how to cook several recipes from my site, elliemay.com. 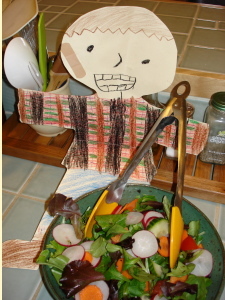 Here he is making Flat Blake’s Super-Blake Salad. It was delicious!! I asked him for the recipe, but he told me it was a secret. Spoken like a true chef! Thanks for visiting Seattle, Blake. We hope you had a wonderful time! To learn more about the Flat Stanley Project, click here. CSA members were instructed to let the little ears dry out for at least a month before separating the kernels from the cob and popping them. Last weekend, I popped my first batch! Removing the kernels from the cob was a bit tricky; the kernels came off without much resistance, but their pointy ends proved to be a bit painful. Next time, I’ll have to employ some sort of tool other than my thumb for this purpose. Once I had a small pile of kernels, I simply popped them in a nonstick pot over medium heat with a touch of oil and salt. 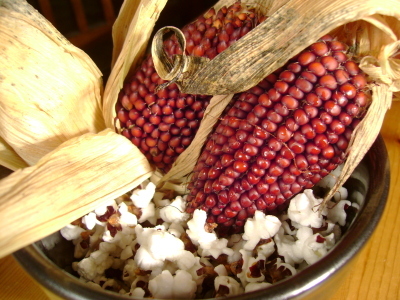 Despite their deep red coloring, the kernels popped up to a nice, bright white. Although they were much smaller in size than conventional popcorn, they were no less tasty. And, the best part? Even the kernels that didn’t pop were soft enough to eat easily. No worries about accidentally breaking one’s tooth with this popcorn! Although it was just a tiny amount, barely enough to even qualify as a snack, I was so happy to be eating this last little remnant from Boistfort Valley Farm‘s CSA season. Sadly, the farm suffered heavy damage as a result of the flooding that swept through Washington State earlier this month. They had to cancel their final produce delivery due to a complete loss of winter storage vegetables. They do expect to be up and running again for next year’s CSA season, however, and I can’t wait. In the meantime, I will savor my two remaining ears of strawberry corn! Check out the crostini I made for my company’s Halloween party today. They’re not quite as scary as last year’s tasty eyeballs, but I think they’re pretty cute. 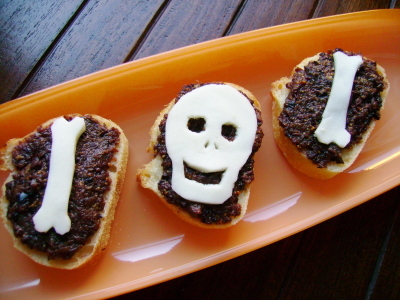 I topped the crostini with homemade Fig & Black Olive Tapenade and then made bones and skulls out of fresh mozzerella. I only made a few skulls because they were more labor intensive. Since I was cutting everything out freehand, my bones each turned out a little bit different. Some looked like thigh bones and some looked like thin ulnas. One turned out gigantic like a dinosaur bone! Happy Halloween everyone! Yesterday, on my way home from the yarn shop, I stopped by The Chocolate Box for some goodies. Ever since Robert coerced me into joining him in his nightly chocolate ritual (and, believe me, he really had to twist my arm), I have been trying to raise the bar a bit by purchasing better quality chocolate than you get with, say, a Kit Kat or Whatchamacallit. I know…I’m a total snob. But, a handful of M&Ms every night is not good for you. A couple of pieces of quality dark chocolate, on the other hand, is practically a requirement for optimal health these days. The Chocolate Box, with its focus on high-end, fancy chocolates, is the perfect shop for this. 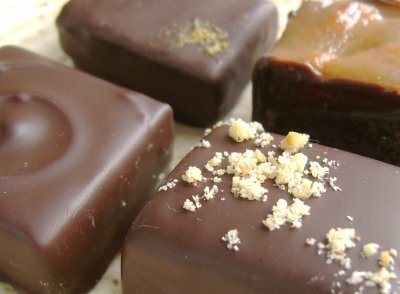 They sell chocolates from many different producers, but the biggest presence in the shop is definitely the much-loved Theo Chocolates. I’ve been meaning to try the 3400 bars for a while now but, on this day, I was in the mood to try a variety of flavors so I picked some individual confections. I couldn’t help but be wooed by the wackier flavors. Hey, when you are spending $2 a pop for these tiny morsels, it’s hard to justify ordering plain-old, unflavored chocolate (even if it is good chocolate.) I chose Fig & Fennel, Peanut Butter, Chipotle Spice and Cardamom Caramel. I also was given two free samples at the shop; one was a Neapolitan and the other was some flavor that I don’t know because, like a brute, I just wolfed it down without even listening to the guy. All of the chocolates were excellent. The Chipotle Spice was surprisingly spicy, and the Peanut Butter was filled with smooth peanut butter cream studded with crispy, salty peanut bits. My favorite was the Fig & Fennel which had a deep, rich fruit flavor. I think the label mentioned that it was made with Washington Merlot (wine and chocolate – what’s not to love?) It was boozy and delicious and definitely something I could make into a nightly habit. I’ve been listening to lots of food podcasts lately so I thought I’d give a little summary of my favorites. What is a podcast you might ask? Simply put, podcasts are audio or video files that are available via the web. You can think of them as a radio shows you can listen to at your convenience. Despite the fact that it contains “pod” in the name, you don’t need an iPod in order to listen. You can download podcasts and play them on any Mp3 player or you can listen to them right on your computer. The benefit of podcasts is that you can subscribe to them using simple software known as an aggregator, often called a podcatcher. When you subscribe to a podcast, your podcatching software will either download new episodes of your favorite podcasts automatically or notify you when new episodes are available, allowing you to download them at a time that best suits you. iTunes, Juice and Amarok will all allow you to subscribe to podcasts. I prefer to use Amarok since it is designed for linux users like me. Bon Appetit – Like the monthly magazine, Bon Appetit’s podcasts cover a wide range of food-related topics. The podcasts are usually paired with an article in the current issue of the magazine, but they are not just a recap of the contents of the article. Instead, the articles are used more as a branching off point. For example, a magazine article about margarita recipes may be fodder for a podcast on types of tequila. Bon Appetit’s podcasts are hosted on a rotating basis by the magazine’s editors (I like the ones with Associate Editor Andrew Knowlton the best.) The podcasts are nice and short, averaging about 15 minutes each. New podcasts come out every Tuesday. Good Food – Good Food is Santa Monica Public Radio/KCRW’s weekly food show. It is hosted by Evan Kleiman. The shows feature a wide range of food topics from restaurant reviews to food politics to specific ingredients. Each show starts off with a report from the Los Angeles Farmer’s Market about what’s in season and how to prepare it (which means that I can start planning meals several months in advance for when those ingredients finally come into season in my area.) Podcasts are around 1 hour each and are available every Saturday. Splendid Table – I have always loved Lynne Rosetto Kaspar’s wonderful NPR radio show, The Splendid Table. She is so exuberant and enthusiastic about food, you can’t help but smile when listening. Now that the show is available as a podcast, I can listen whenever I want (usually Saturday mornings over coffee.) The first part of the show is devoted to interviews with guests; the second half features listener questions and sometimes my favorite segment, Stump the Chef, where Lynne has to come up with a delicious meal based on 5 ingredients in a caller’s fridge. Christopher Kimball of America’s Test Kitchen serves as judge and deems whether Lynne’s creation is edible or not. Podcasts are about 1 hour long and are available every Saturday. Eat Feed – Eat Feed was the very first food podcast I ever listened to. It is hosted by Anne Bramley. Ms. Bramley, with her soothing voice and food scholar intelligence, provides a very insightful podcast. The podcasts are broken up into four “channels” each with a different focus. There is “Amuse Bouche”, which focuses on food terms and their history, “In Season” (self-explanatory), “Eat Feed Midwest”, which highlights Midwestern cuisine and can be very enlightening for a West Coaster like me, and “Now Serving”, in which Anne Bramley teams up with Leite’s Culinaria’s David Leite to explore what is happening in food today. Since it was my first podcast, Eat Feed will always be my favorite. John Edwards is supposedly a fan too!